Description: The hotel "Varazi" is located in the centre of the city, in the most prestigious district called Vera. It is in walking distance from the Philharmonic and from the movie theatre "Amirani", as well as the main street Rustaveli Avenue, which is full of museums, theatres, bars and restaurants. There is a park in ecologically green zone, comfortable swimming pool and Chess Palace near the hotel. There are the convenient and elegant rooms with the views on the central street. These rooms are on the sixth and seventh floor and some of them have balconies where you can also rest. These rooms are equipped with working desk, queen-size bed, direct dial phone, voice mail, data port, air conditioner, mini-bar, hairdryer, color-TV, smoke detector. These rooms have wide windows which protects from noisy and sun. There are working desk, mini-bar, big wardrobe, king-size bed with lamps, voice mail, data port, cable-TV, air conditioner, hairdryer and smoke detector. The Suite consists with two rooms - guest room and sleeping room, with soft furnisher. There are two TV-sets, mini-bar, working desk, voice mail, data port, cable TV, air conditioner, hairdryer and smoke detector. 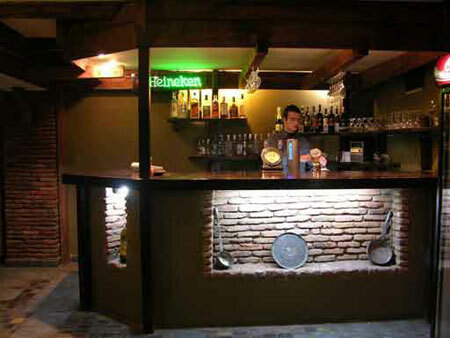 The Bar "Violin" (for 30-35 persons) is located on the lobby level where you can drink soft and alcohol drinks. The bar is daily open from 11:00 am. to 11.00 pm. 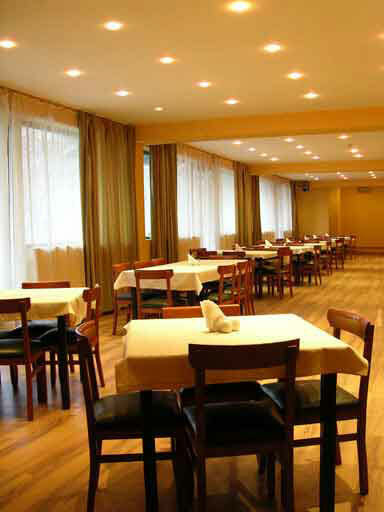 The European restaurant "Sative" (for 120-150 person) is located on the third floor. The breakfast is available every morning from 08:00 am. till 11:00 am, also for dinner, supper and business meetings. Georgian Restaurant "Ormo" for dinner and supper (150-200 seats) also offers oldest Georgian wines and Caucasian dishes. The Ballroom on the third floor which has maximum capacity for 150 persons is available for business meetings. Modern facilities will make your meeting efficient and comfortable and natural day light is available for you. The Business Centre is located on the second floor where you can find modern communication facilities for your convenience (Fax, Xerox and Internet). Meeting room for 20-25 persons is located on the third floor where you can make your meeting with your colleges and partners or spend your free time with cup of tea or coffee.